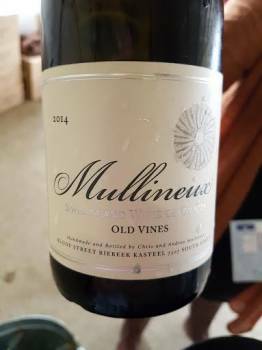 In an effort to beat the heat, Swartland winemakers tend to pick early and the wines can appear just a tiny bit underdone, which is how I felt about the Mullineux White 2013. The 2014 is now out, a wine that winemaker Andrea Mullineux refers to as her “favourite… we’ve ever made” and it does seem to be very well judged indeed. It’s a blend of 73% Chenin Blanc, 13% Clairette Blanche, 7% Viognier and, for the first time, 7% Semillon Gris. On the nose, lime and white peach, flowers, dried herb, a hint of spice and a little leesy complexity. The palate is super-impressive. On entry, the wine seems quite tightly wound but then real peacock’s tail stuff, the flavours fanning out and echoing. The addition of the Semillon Gris seems to be a masterstroke adding a little refreshing “green-ness” to the typical stone fruit and pithiness you’d normally expect. Wine Cellar price: R199 a bottle.